The Admirable Mother Orphanage is the inspiration of the late Elisabeth Heiser, who dedicated the later part of her life towards helping the children of the D.R.C. After taking a visit back to her home country of the D.R.C. in 1995, Elisabeth was appalled by the number of orphaned children running in the street of Kinshasa, many of them orphaned by civil war and AIDS. Inspired by President Kennedy’s inaugural remark, "Ask not what your country can do for you, ask rather what you can do for your country,” Elisabeth opened the Admirable Mother Orphanage for girls in the summer of 2000. 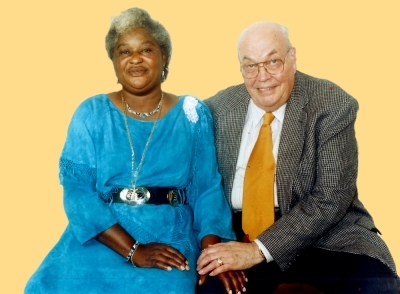 After passing away in 2004, Elisabeth’s daughter, Elizabeth Fochive, took over the orphanage and created the Elisabeth Ph Heiser Foundation, registered with the Congolese Government and certified in the United States as a non-profit organization. Elizabeth runs the orphanage and Foundation with the same love and dedication as her mother. Elisabeth with Cardinal Etsou at the orphanage opening in 2000. Born Elisabeth Philomene Mukadi-Ngandu on June 30, 1940 in Idiofa, Bandundu Province, Elisabeth was herself orphaned at an early age. Her father died and when she was two years old and because her mother was too young to care for her, she was taken in and cared for by her grandmother. Raised as a nun for most of her life, in 1988 she decided to take her life on a different path and emigrated to the United Sates, joining the Third Order of Discalced Carmelites in Silver Spring, MD. There she met and fell in love with Dr. John Heiser, a retired professor of Ancient and Medieval Philosophy. After marrying Dr. Heiser on August 27, 1994 she moved with him to Albuquerque, NM. In 1995, Elisabeth Heiser payed a visit back to Zaire (now the D.R.C.). While there, she was appalled by the number of orphaned children running in the street of Kinshasa, many of them orphaned by civil war and AIDS. Because Elisabeth had herself lost her father when she was just a child, she understood what it meant to be deprived of family support in a strongly patriarchal society. Remembering the Biblical injunction, "care for the orphan and the widow" (Jas. 1:27), she resolved to build an orphanage for children in the D.R.C. To generate funds for the foundation Elisabeth began a Congolese import/export business. She would buy African artifacts on her trips to the orphanage and sell them in Santa Fe at an "African Imports" booth during the weekend flea market. 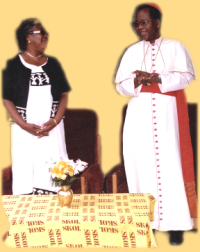 In 2000, she had gathered enough funds to open the orphanage to the children of Kinshasa and was blessed by his Eminence Frederic Cardinal Etsou, who supported the orphanage for the rest of his life. Unfortunately, the trade business was never able to fully cover orphanage needs and most of the support came from Elisabeth and Dr. Heiser's personal savings. Suffering from diabetes for many years, the frequent trips back and forth from the D.R.C. placed a heavy toll on Elisabeth's health. On April 10, 2004 Elisabeth Ph Heiser passed away. Elisabeth’s daughter, Elizabeth Fochive, took over responsibility of the orphanage after her mother’s death and now provides support with the same love and dedication as her mother. In order to form support for the orphanage, Elizabeth created the Elisabeth Ph Heiser Foundation, registered with the Congolese Government and certified in the United States as a non-profit organization. While waiting for the needed financial support, Elizabeth now serves as the orphanage's main provider through her own personal salary and keeps fighting for the survival of the orphanage.